All the pictures on our pages provide details of where they were taken if you hover a cursor over them and they can all be clicked to open a larger version in an Overlay (Lightbox) or Popup Window. The image display options can be set on the settings links at the bottom right corner of every page which includes pictures. We had visited Katakolon previously, but only explored the church, museum and shops in the small seaside town. Their Municipal Museum of Ancient Greek Technology is one of our favourite museums and we can easily spend an hour looking at their displays. It is only 300 metres from the port, at the end of the main shopping street, and the quickest way to get there is to walk past the row of waterfront cafes - see A Magical Mystery Tour of the Ancient Wonders of the World on Queen Victoria in 2012 for more details of our last visit and the town. Cruise ships come to Katakolon because it is the perfect place for tours to the ancient city of Olympia which is only 25 miles away, local transport seemed plentiful and was advertising trips at at 10 euros return although it must be remembered it was out of season. Olympia was one of the chief religious centres of ancient times, and also played host every four years to the Olympic Games. The first Games took place in 776 BC and continued until AD 393. The modern Games recommenced, in Athens, in 1896. 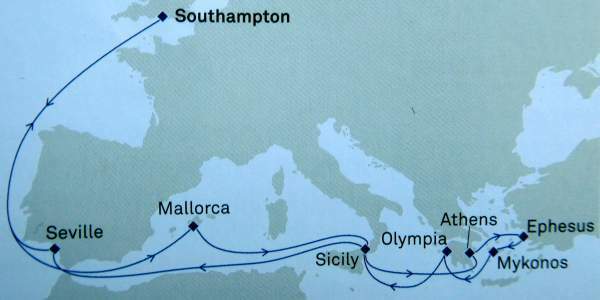 There are always organised tours from the ship to Olympia on offer, varying in price around $75. In contrast there are taxis at the port gates who offer 4 hour transfers for just slighly more per car, and then there are bus transfers and train transfers at 10 euros. The train is a good option. It leaves from the little station by the Museum of Ancient Greek Technology and it runs on a narrow single track line which looks abandoned but is not (quite). The timing of the first train in the morning was unclear; the standard daily timetable is supposed to provide a train at 0900 and the sample special cruise ship timetable mentions the first train is at 0840. We got off the ship at 0800 and walked to the track to find out what was planned for today. We guessed a Sunday would be different. Walking away from Katakolon along the railway track we eventually saw the train coming slowly towards us and then followed it back to find the station terminus which is also advertised as a cafe and "Ice Station". The driver said that the train would depart at 0915 today, then there would be another train to Olympia at 1015. There would be only one train back from Olympia, at 1315. So the train option only works if it is possible to fit with the timetable. We were very happy; 0915 was a good departure time and allowed just 3 hours at Olympia in order to be back at Katakolon at 1400. The Internet stated that there were group tickets available, 20 euros for 4 people instead of 10 euros each, but that is wrong. We paid our 10 euros and joined the train. The seats are comfortable although it is only a small train with two carriages, of type Bombadier built in Germany. With only the one cruise ship in port it was not full. We stopped at Pyrgos to collect a passenger then continued through the countryside to Olympia, arriving just before 10.00. Except at Pyrgos station it is all single track and in many places the rails are overgrown with grass and there are trees encroaching on the sides and clipping the carriages. We took photos on the way back. For some of the journey we stood in the front carriage looking through the glass over the shoulder of the driver. The train timetables vary depending on the day and the number of cruise ships, and the route from Katakolo to Olympia is run by TrainOSE. The schedule for the day is written by hand on a board at the kiosk at the platform. They have three sets of carriages, which they keep at the intermediate station in the town of Pyrgos. The main line also went through Pyrgos until recently and we met a train enthusiast on the journey who had previously travelled between Kalamata and Corinth on the main line. It was not operational in 2016 and if we understood correctly the economic crisis in Greece led to the suspension of all passenger and freight services on the metre gauge railway system in the Peloponnese in 2011 and that it is unlikely services will ever resume as a publicly run system, although some private services occasionally run such as this railway. This is therefore a unique service well worth supporting. The line spacing on the metric gauge is 1000mm whilst the more usual gauge is 1435mm. A map of Olympia was given with our train ticket and it was only a short walk past the Archaeological Museum to the entrance gate. We bought our ticket (12 euros for adult, 6 euros reduced rate and free for EU students) at the museum and there were few people and no queues. There are two other museums, the Historical Museum of the Olympic Games History and the Historical Museum of the Archaeological Site Excavations which we did not visit but are included in the ticket. Our route around the site was generally anti-clockwise, beginning at the Gymnasium on the right just inside the gate. In the distance there were tour groups clustered in the area of the Temple of Zeus which we would be visiting later. The gymnasium is a large area where athletes prepared for the Olympic games and included an undercover practice running track. Continuing around the edge of the site, the next major area is the large square Palastra, the wrestling ground, with its double rows of columns surrounding a cenral space. It is a good spot to rest under a tree and look at a map. The next significant building is the Byzantine basilica with its remains of decorated columns and ornate screen decorated with crosses. Beyond the basilica is the Leonidaion, a hotel for important visitors, with its rows of small rooms and central garden and swimming pool. Then in the far corner are two more Leonidaion buildings - the SW building and the Thermae baths. Having seen the Temple of Zeus in the distance we approached it from the Leonidaion which gave a second opportunity to look at the central garden and its water supply. The Temple of Zeus is not able to be visited and can only be viewed from the outside, although there are steps leading up. It is a Doric Temple, with 13 large columns on the longer sides and 6 on the shorter. One example of a column has been raised and there are many broken column pieces on the surrounding ground. Some of the statues are in the Museum. The roof was originally made of marble. It was in the temple that the victors were crowned with their wreaths made from branches from the sacred olive tree. Inside the temple was the 40 foot "chryselephantine" gold and ivory statue of Zeus, one of the seven Wonders of the Ancient World. A painting of how it might have looked is in the Museum, based on coins and sketches from the time. South of the temple is the Bouleuterion, the Council House of the Olympic Senate. Then beyond the Bouleterion is the South Stoa. We admired from a distance. The highlight of a visit to Olympia is to look at the Stadium and it was quickly accessed by crossing the ceremonial area in front of the Echo Hall and entering through the arched gate and down a passage. Before the gate were a row of Zanes bases which were there for athletes who had been found to have cheated. They had to pay for a large bronze statue of Zeus as penalty. Athletes came from many countries, but were only men. The row of treasuries were built by different states. Our map showed an Old Stadiun which was narrower and longer than the current version. There are marble starting and finishing lines, and we knew from previous visits to the museum in Katakolon that there was a system of starting gate, with two lines of rope. The idea was to run the length, measured as 600 standard footsteps of Hercules. Up to 40,000 spectators were able to watch the events from the grassy slopes. The Metroon Temple is then inside the ceremonial area and by its remains is where the Olympic torch is lit in modern times, from the rays of the sun. Towards the entrance gate is then the Nymphaeum, a large semicircular fountain. Pictures show a major aquaduct to supply the water and a large statue of a bull in the centre. Nearby the next temple is the Temple of Hera which is a well defined Doric temple. There are 6 columns on the shorter side and 16 on the longer and they are all different. Beyond the Temple of Hera is the partially reconstructed Philippeion. When built by Alexander the Great it had 5 chryselephantine statues of the family on the central podium, then a circle of Corinthian columns and finally Ionic columns on the outside. The final building of interest is the Prytaneion, the political centre of the sanctuary. It contained the chapel where fire burned continually and also the dining room for official guests and priests. This visit to the Olympia Sacred Precinct had lasted 2 hours and we had been able to explore the site thoroughly although we were only able to absorb the finer details on the information boards (which we always photograph) later. There remained 45 minutes before we returned to the railway station and these were well spent at the Archaeological Museum. The model plan of the site showed how the buildings might have looked and the statues, pediments and friezes from the site showed the excellent and exquisite craftsmanship of those times. We arrived at the station on Olympia to find our train waiting for us. We were not sure whether it was to depart at 1315, as stated by our driver, or at 1300 as written by the station master. In fact it left at 1308, having counted people to make sure that everyone who had purchased a return ticket on the two morning trains was on board. My original timetable had showed a train at 1308 so perhaps that was the standard departure time. We arrived back at Katakolon at 1355 with just enough time to persuade the caretaker of the Museum of Ancient Greek Technology to stay open for a few minutes after her closing time of 1400. More people arrived and she eventually insisted she was definitely going to close at 1500. It is a small privately owned museum contained approximately 300 examples of important ancient Greek technologies. These ranged from measuring time using sundials and hydraulic clocks, the Antikythera calculating mechanism, a precursor of the steam engine, cranes and winches for moving large blocks of stone, and military and naval technology, including the repeating catapult of Dionysios and the v-spring catapult of Philon having looked at naval catapults at the Nautical Museum in Piraeus. The inventions were by famous men of those times including Archimedes, Plato, Aristotle, and Pythagoras. The exhibits were all made by the owner of the museum, Konstantinos Kotsanas, during 22 years of research and were of exceptional quality. There were Android based pads you could borrow to listen to information on all the exhibits as well as the excellent explanatory text. We were very impressed on our first visit and purchased his book to look at the projects when we got back home although they said most of it is on the web (www.kotsanas.com). One exhibit stands out: the Antikythera calculating mechanism is a masterpiece, several thousand years ahead of its time, and the precursor of modern calculating mechanisms - there was a fascinating TV programme some years ago which explained how it was discovered, and the years of research to find out how it all worked and to finally reconstruct it.